Recently the fourth and fifth grade classes have both begun literature units exploring historical fiction with a special focus in the fourth grade on refugee stories. These two new books are both excellent choices in the genre. A Story Like the Wind begins with 9 people on a boat on the open waters of most likely of the Mediterranean Sea. The refugees are all sharing the small supplies that they have managed to bring such water or a bit of food, however one boy has nothing to share but the story of a white horse that through his refusal to be tamed brought about the end of a despotic tyrant. 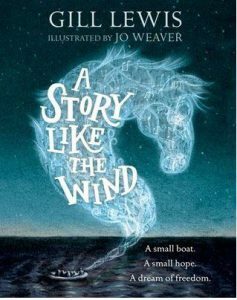 It’s an especially lovely book with a scattering of beautiful drawings along with the story-within-a-story text. 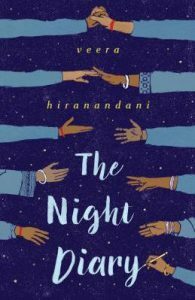 The Night Diary is set in 1947 at the time that Pakistan was established as a separate state from India. This is a problem for young Nisha and her family as her father is a Hindu and must now relocate the family. Because he is a doctor, Nisha’s father delays the move until another doctor can come to replace him at the hospital. This means that when the family finally begins their journey ethnic tensions and conflict have become quite dangerous. The perilous trip is also complicated by drought conditions and the health of both Nisha’s elderly grandmother and twin brother. The text of the story is recorded in diary entries from Nisha to her mother who died during childbirth. It is quite a heartfelt and memorable tale.